This post was supposed to be a cocktail. Something springlike and sparkling because we just bought a house. And, well, it’s worth celebrating. The problem is it’s 45° and raining, I’m leaving on another 10-day trip to Latin America in 36 hours, and the idea of packing and moving and fixing all of the things in the house that need fixing has my brain in overdrive. Don’t get me wrong – I’m excited and I know this is a huge milestone – it’s just all a little overwhelming right now. So a cocktail, however springlike and celebratory, is not what I needed today. What I needed was something comforting, energizing, nourishing, and whole. Something to warm me up and keep me focused. Like this soup. 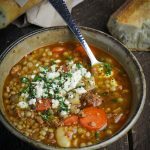 This soup, which is lightly adapted from Sprouted Kitchen Bowl + Spoon, is healthy soul food (because another thing I need right now is to be especially careful about what I put in my body). 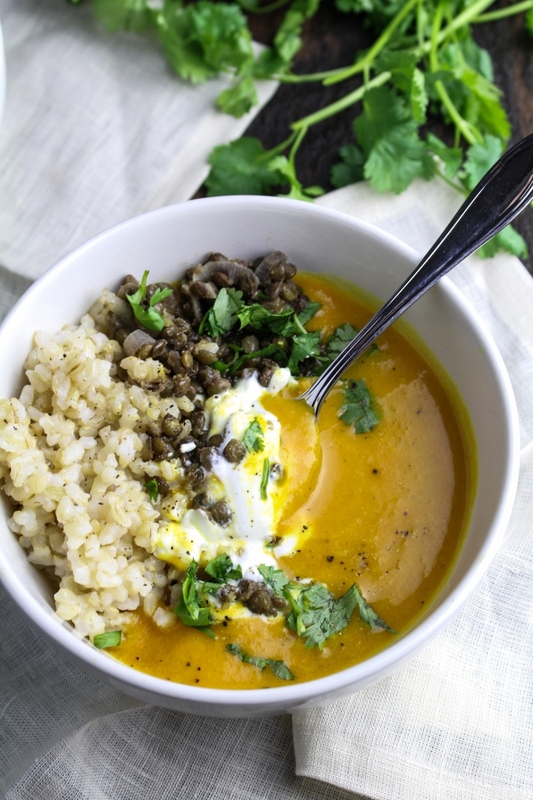 It’s based on a mixture of gently spiced sweet potatoes and coconut milk, served with a few spoonfuls of crisped black lentils to give it more staying power. I followed the original recipe fairly closely, only adding the step of roasting the sweet potatoes for a bit more sweetness and depth, and serving the whole thing over a bowl of brown rice for extra body. 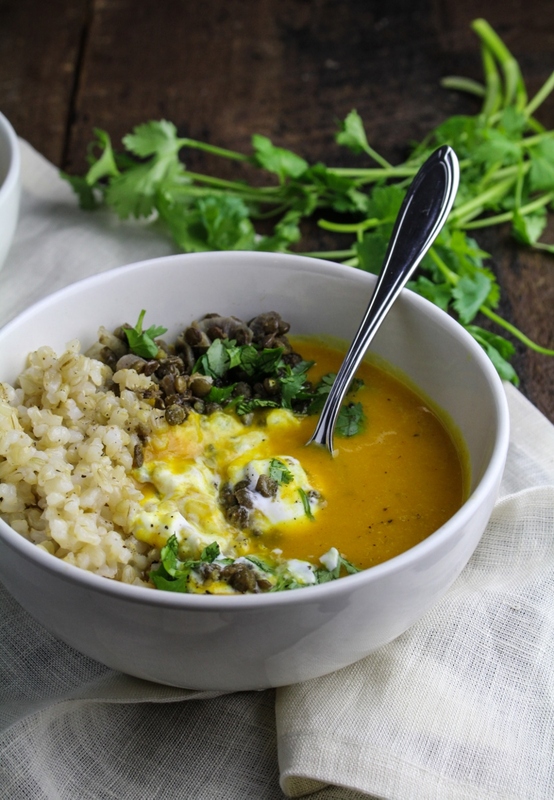 The flavors in this are balanced just right – I often find vegetable purees too spicy or too one-dimensional, but this uses a good amount of fresh ginger, and just a touch of turmeric and curry powder. You can taste the coconut but it doesn’t overwhelm the other flavors, and the soup has a good body. It’s a keeper. 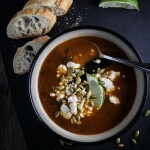 And despite the fact that it’s the first day of June and Sweet Potato Soup sounds like something you should make in October, it’s exactly what I want to eat right now. I promise I’ll tell you all about the house soon. In fact, you might even get tired of hearing about it, given that we’re planning on remodeling practically everything, and I’m sure I’ll be coming here to share our victories and challenges. And maybe later this summer – once we have some furniture and a place to enjoy a cocktail – we’ll get to that festive, sparkling drink. Slightly adapted from Sprouted Kitchen Bowl + Spoon. Serves 6. Preheat the oven to 400°F. Toss the sweet potatoes with the olive oil, salt, and pepper and spread out on a large rimmed baking sheet. Roast until tender when pierced with a fork, about 25 minutes. Remove from the oven and set aside. Melt 2 TBS of the coconut oil over medium heat in a large saucepan. Add the onion and saute until translucent, about 3 minutes. Add the turmeric, curry powder, and ginger and saute until fragrant, 2 minutes more. Add the roasted sweet potato and broth and bring to a boil, then reduce heat to a simmer. Simmer for 2o minutes, then remove from heat and carefully transfer to a blender. Add the orange juice and coconut milk and blend until very smooth. Season to taste with salt and pepper. Set soup aside. In a small frying pan, melt the remaining 1 TBS of coconut oil over medium heat. Add the shallots and saute until translucent, about 2 minutes. Add the cooked lentils and saute until crispy, another 2 minutes. Remove from the heat. Scoop a 1/2 cup of brown rice into each bowl. 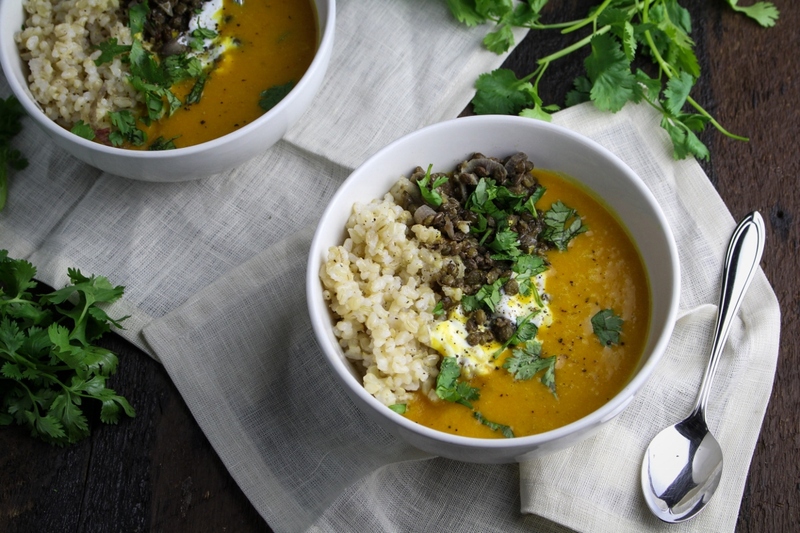 Pour soup over the rice, then top with lentils, yogurt, and cilantro. 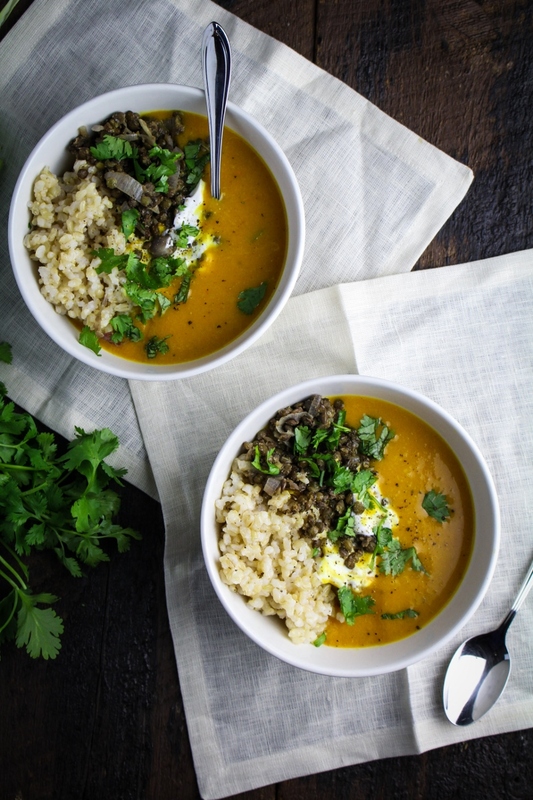 Congrats on the house and this soup looks amazingly delish! Thanks for the wonderful-looking recipe. Best wishes on your new home. An adventure in the making. Oh my! This absolutely sounds so delicious and right up my street! Congratulations on the house and hope it’s all good! This looks absolutely divine, I would love to be eating this right now! Congrats on the house! Even though it’s peak of summer out here, that bowl is tempting me to give a try. Love the color. Just made this…absolutely delicious. You need three large sweet potatoes if you like a thicker soup or perhaps a little less stock if using just two. I love sweet potatoes,lentils, rice and all the spices. If it was not 113F right now i would cook it today. Delicious! I made the soup thicker, more like a pure, and it tasted fantastic! I just tried the recipe and I liked it. I made a change with using quinoa but very filling. The next time i make this, I won’t roast the sweet potatoes because it too long to make the dish. I’ve made this dish so many times now. I loooove it! I use black beans instead of lentils, often frying them up with some chopped mushrooms, with salt and some chilli powder or cayenne pepper. It doesn’t take much time if you cut the sweet potato quite thin as instructed. Then while it’s roasting you can get on with the base of the soup and put the rice on. After adding the potato to the soup you can fry the lentils then blend the soup. It all takes between 30-45mins. Great recipe. Top marks. Thanks for posting this. Delicious. I agree with the other commenters that it wasn’t thick enough. I will lessen stock next time. It’s rare for me to find a recipe that’s so close to perfect. This dish was delicious! Raves around my table last night. I’ve made lots of soups and I never would have thought to both roast then simmer the potatoes, but I think the roasted/carmelization definitely added to the yum factor and the time it spent simmering in all that fragrant broth was key for flavor infusion. I was concerned about it being too thin too so I left the top off the sauce pan while it all simmered which helped it evaporate some and intensify the flavors at the same time. 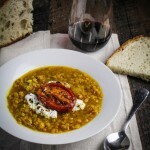 Used French green lentils instead of brown, they have a sturdier bite and a mild spiciness that I love, added a clove of finely chopped garlic to the onion. Used my last shallot the other day so substituted scallions. Really, really great recipe! Will be making this again. Very yummy, I made this soup twice now. The first time I forgot to add the coconut milk and orange juice and only found out later that evening. Nevertheless it tasted very nice and it was quite thick. The flavour reminded me a bit of pumpkin and my boyfriend even said that it was nice, the pumpkin soup! I thought I’d mention it here as I’ve read comments about the soup being very thin, so this might be an idea if you want a more thicker soup, but the flavour will be slightly different as well. Last night I made it with the coconut and orange juice and I still love it, not sure which version I prefer to be honest. Also I think it tastes even better the day after! I made this for for dinner last night and my husband and I LOVED it! It’s so filling and delicious – definitely adding it to the rotation. Seriously delish! Do you use coconut milk from the carton, or do you use the canned? I use canned coconut milk – that’s the only kind available in my local stores! Leave out the orange juice! Soup was thick and delicious before, now it just tastes like OJ. Waste of delicious ingredients, disappointed in this recipe. I just made this soup and it was amazing I did not have fresh ginger but used ground ginger instead. I thought all the flavors blended beautifully together, love it.Thank you for the awesome recipe, will definitely be making this again! So glad you enjoyed it, thank you for sharing your thoughts! This was such a hit with my family! Even my four year old ate it up, which is not an easy thing to accomplish! 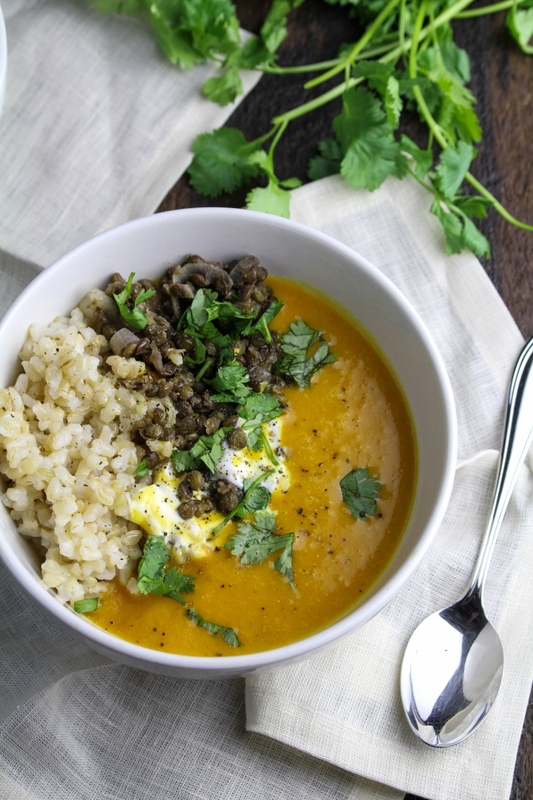 I left out the lentils and orange juice and increased the coconut milk to a whole can. I also saute the shallots with the onions so we didn’t miss out on their wonderful flavor! I’m excited to try more of your recipes! I shared your recipe (with variations above) on my blog. I did not use any of your photos and credited your recipe (with link). This was delicious! I love healthy veg options that taste good. I followed the recommendation in one of the comments and only used ~2 Tbs orange juice. I also didn’t have shallots so I used about 2 large cloves of garlic instead. I had a microwavable brown/red rice pack with kale and chia that I used for the rice, and for the lentils I used a pouch of lentil soup and black beans. This will definitely go in my recipe box. I made this delicious recipe tonight with a few variations! It was amazing So full and satisfied. I added in 3 small cloves of garlic, a touch of cumin and a few cauliflower florets to thicken the soup! I made this soup yesterday and it was amazing. A friend who ate with us said that has been addicted to its flavour and taste . thank you! I don’t usually leave comments but this is by far one of the best soups I’ve ever had and one of the best dishes I’ve ever made. I am so full of deliciousness right now. Thank you. I’m so glad you enjoyed it Lily! Reminds me that I need to make another batch of this soon. What variety of sweet potatoes do you use? I tried this recipe with Japanese sweet potatoes when I first made it and I’m thinking of making it again with regular sweet potatoes (the very orange ones). Hi Cami – Yes, definitely. 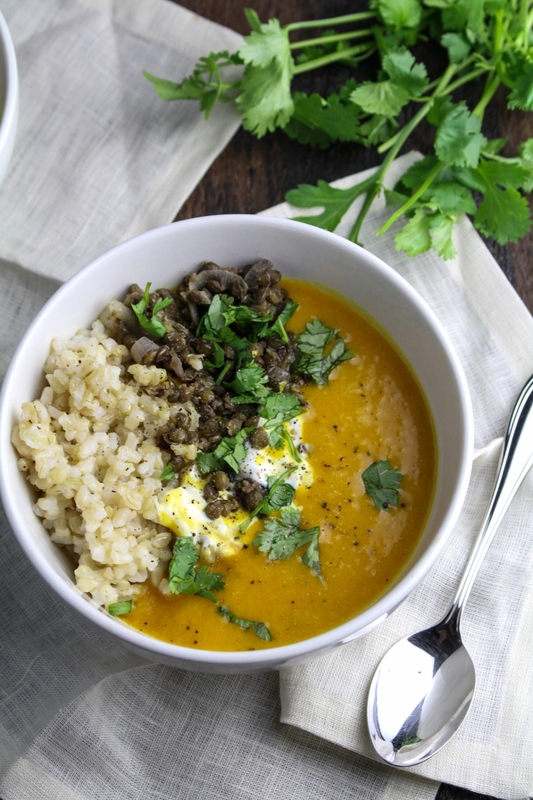 I like black lentils because they have a nice texture/bite to them, but any kind of lentils will be fine. Just note that the cooking time varies depending on the type, so keep an eye on them and test them frequently or they’ll be mushy! I made this today because I was craving something comforting, healthy, and meatless. I used three large sweet potatoes and I added the orange juice to taste. Maybe about 1/2 cup. I also blended it with a immersion blender. I used about 3/4 tbsp of curry powder and 3/4 tbsp of garam masala. I also used the already cooked lentils from Trader Joe’s. This was exactly what I needed. It was absolutely amazing! I loved the cilantro and Greek yogurt dollup on top. Even my three year old is eating some for lunch. Thank you for such a great recipe! Hi Lisa – Yay! So happy you enjoyed this! Always a win when something healthy is also delicious, right? Soooooooo good! I used 3 sweet potatoes and the thickness was perfect.. yum! My friend ate it up and I loved it as well.. thank u fir a great recipe.. it’s got a few steps to it, but worth it!